I was highly impressed with seeing how Ontario Cricket Academy & Club is promoting cricket in Canada. With highly trained coaches, I really loved the atmosphere of the team when i played with them. My interaction with young budding cricketers was very pleasing. I have played (and coached) at the Ontario Cricket Academy & Club in 2012 and 2013. I must say that the club was a home away from home- and thoroughly enjoyed my time there. The talent I have seen there was really impressive and I am sure many of these players will move to higher levels with the continued guidance of Derek and the coaches there. I can easily say that the methods and coaching level at the OCA&C is on par with the best academies in India. Wishing the team, youngsters and supporters all the best for the future. "I was an overseas player/coach at the OCA&C in 2011 and totally enjoyed all aspects of this great club. The most amazing thing to me was the commitment of the coaches, especially Derek who goes to great lengths to help and guide his players. The atmosphere and overall feeling amongst the players, management and supporters is incredible. I would recommend this club to any player who wants to be part of a great organization that really cares for you and your cricket- and will help you to reach your goals"
"I am very pleased with the talent at the Ontario Cricket Academy & Club. The youngsters are lucky to have such an experienced and dedicated coaching staff. Keep up the good work!" 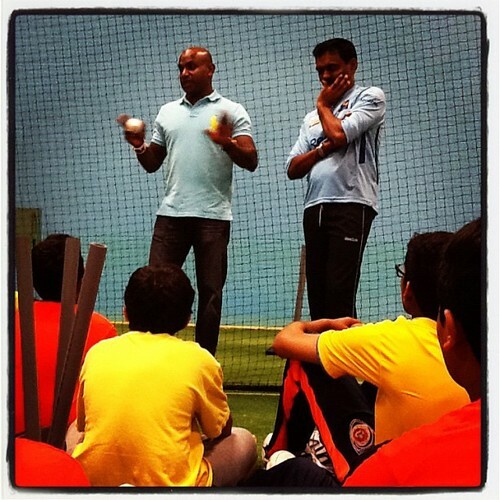 - Sanath Jayasuriya held an exclusive cricket camp for the Ontario Cricket Academy in May 2012. During this camp, Sanath Jayasuriya worked with many OCA&C players who were playing for Canada at the youth level or were on the brink of selection, in his words "there is not much difference between these players and our top youth players at home". My time with the Ontario Cricket Academy & Club proved to be a great learning phase in my career, it was my first stint for a foreign club and it provided me with a huge opportunity to explore my both professional and personal growth. Playing as an overseas player made me work harder on my game, made me perform day in day out and just the mentality of being strong came upon automatically. I got amazing support from the Club President, Coach, friend, mentor, whatever you may call him, Mr.Derek Perera and my team mates. I can proudly say I have another family of cricketers, brothers and friends back across the other side of the world who have made a great positive impact in my life . Would like to wish OCA&C all the best in all future endeavours and I am a life time club member. Love, regards and best wishes to everyone at OCA&C. My 3 months stay with OCA was a pleasure. I enjoyed every moment I was there and being around a professional organization made me even more comfortable. I learned a lot from Derek Perera and the other staff that are currently associated with this organization. Being in Canada for the first time playing cricket, I felt right at home. The pitches and the level of cricket itself was a wonderful experience and a complete difference from the Caribbean, as I got the chance to play more swing bowling (so I learned to play balls below my eye level). It was a very helpful and enjoyable stay. The structure of the OCA itself was really well put together for all ages and had facilities for different seasons (Winter and Summer). I would advise anyone to join their structure because they are true professionals.